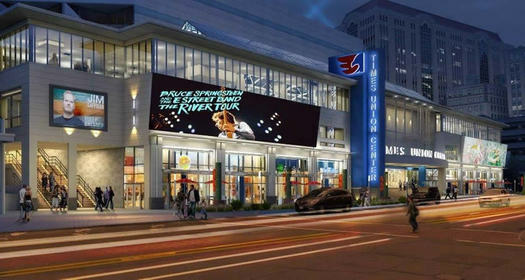 A rendering of what the arena's exterior will look like after the current atrium renovation is finished. + And the arena will be a site for the first and second round of the men's basketball tournament in March 19 and 21 in 2020. Getting these sorts tournaments to return to Albany has been a longtime goal for the TU Center's management and local officials. Some of the aspects of the Albany Capital Center -- specifically the high-ceiling multi-purpose room, which can hold three full-size practice basketball courts -- were designed with this goal in mind. The hope has been that adding the Capital Center to the mix, along with the atrium upgrade project, would make Albany a more competitive site. genuinely excited at this news! The Capital region(notice I didn't limit it to a particular city?) is a hidden gem---those who grew up here don't know it (ha ha) but we "transplants" do! As I noticed when I first moved here: the Region has a ton of potential, all of the right ingredients, but...highly resistant to change. Very much looking forward to this as well. College bball tourney games, even if you're not a basketball fan, are an amazing atmosphere that you can't help but get caught-up in.